Are you looking for ways and intends to make your windows spotless once more? Do you want to know how to skip unpleasant tasks like window washing without lifting a finger? You have picked the right company – the specialists of window cleaning in Broad Street will deal with this matter in short time. Your windows, their frames and ledges will look great, we promise that! You will no longer need to give up your leisure time – the results of our activity will absolutely delight you. Our services combine top-notch quality with affordable price rates, so don't hold up – place an order now to save time, effort and money! We also provide our professional services in nearby areas: Cheapside, Bishopsgate, London Wall, Moorgate, Broadgate. We provide domestic and business window cleaning by using sophisticated methods. You can rely on our expertise for all types of glass surfaces, skylights and conservatories. For windows placed up to your fourth floor, we use water-fed extension poles. This procedure is handy and allows risk-free cleaning procedures – the poles are connected to the water supply in the vehicle. For higher window surfaces, our rope access option will grant you fast and efficient end results. You can profit from these methods right now – just call 020 3746 3113 and book a visit! With our experience and craftsmanship, the good look of your property will be noticeable swiftly – the adepts of commercial window cleaning will manage with this matter. We utilise water-fed extension pole system for speedy and effective window cleaning, up to the fourth floor. For high-rise office buildings, we use up-to-date rope access techniques. With our gear, we are prepared reach the highest glass panes, even on the skyscraper-sized buildings London is known for. From small shops to towering business scrapers, we guarantee top-notch services – book, now! The technicians have the skills and the needed equipment to provide you with both domestic and commercial window cleaning. You can depend on us for every type of glass surface cleaning. For example, we can clean small or double windows, sash ones, French doors, bay windows and patio doors. Moreover, if you have garden glass surfaces, greenhouse or roof windows, we can clean them as well. We use the most progressive methods and the latest equipment for all the previously mentioned types of windows. 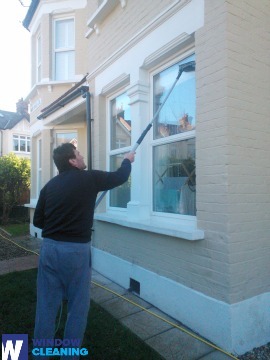 The experts of window cleaning in Broad Street will revive your house. We offer excellent window cleaning services in Broad Street. Our practice includes water fed extension pole system and also high-pressure cleaning. We guard your health and safety with non-toxic detergents and purified water. Be one of our satisfied customers – dial 020 3746 3113 and get in touch with our customer service staff. You can also order our services on-site – just fill in our short request-a-quote form or use our chat option.